Looking for something well beyond your typical city sushi spot? 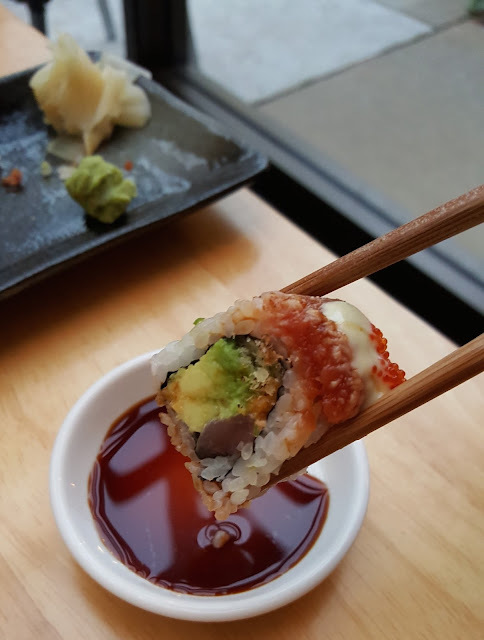 Check out Ani, a sleek Lakeview restaurant serving Japanese cuisine including sushi, cold and hot appetizers, ramen, and robata items. 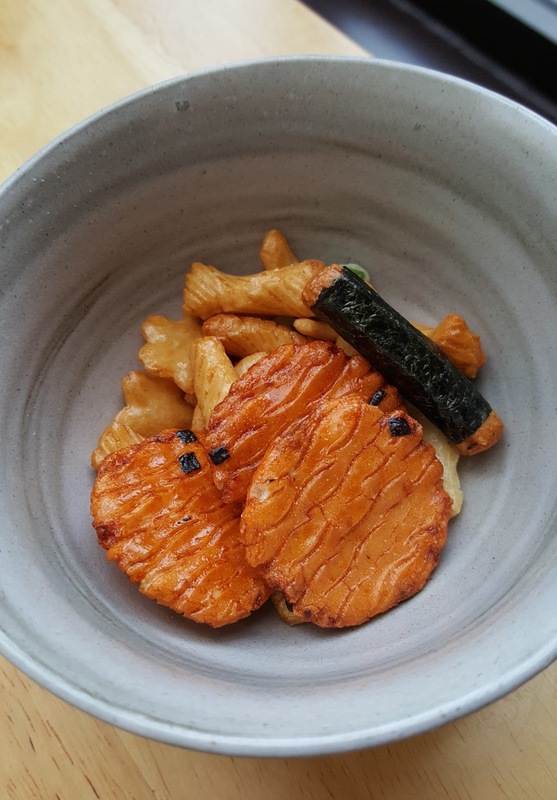 The restaurant is the brother to Arami, and the name Ani translates to elder brother, named after co-owner Ty Fujimura's older brother, Troy (awww). The BF and I were invited in to check out a chef's tasting menu featuring a variety of items spanning practically the entire menu. This was more than a tasting, it was a culinary experience. 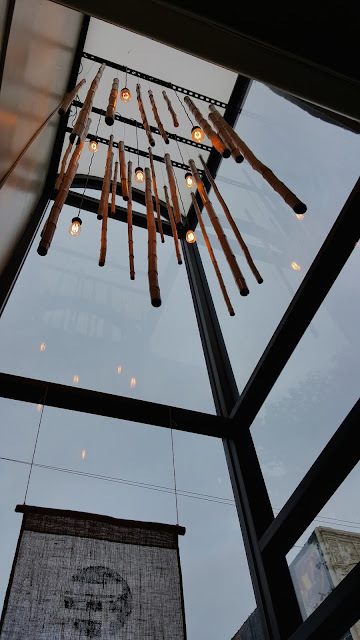 The restaurant itself is tranquil and bright, and luckily for us, we grabbed a great corner table with beautiful lighting above. To welcome us, our server poured each of us a generous glass of house sake. The pour overflowed into the box underneath, a sign of prosperity, welcoming, and generosity. 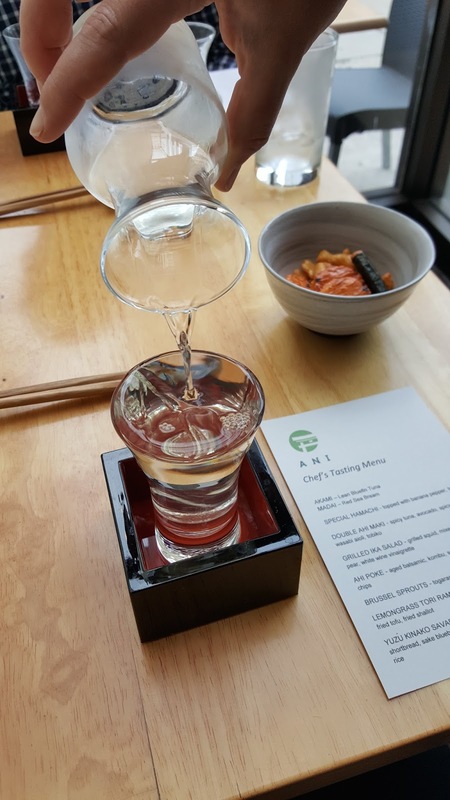 While we waited for our first course, we sipped on our sake and enjoyed some crispy soy snacks. 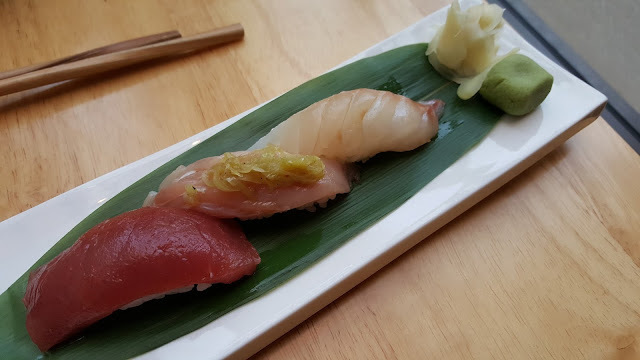 The seven course menu started with three pieces of nigiri for each of us: akami (lean bluefin tuna), hamachi (topped with banana pepper and truffle oil from Old Town Oil), and madai (red sea bream). We enjoyed each piece without anything extra. The fish was fresh and light and we especially enjoyed the hamachi with a hint of spice from the banana pepper. After the nigiri, we shared the double ahi maki with spicy tuna, avocado, spicy mayo, wasabi aioli, and tobiko. 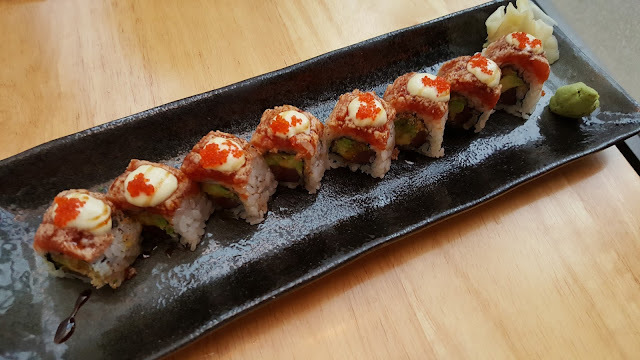 The tobiko gave the roll a nice crunch, while the flavor profile was slightly sweet and spicy. This was the BF's favorite course of the night and I'd recommend the maki to anyone. Our salad course was another light option, the grilled ika salad. 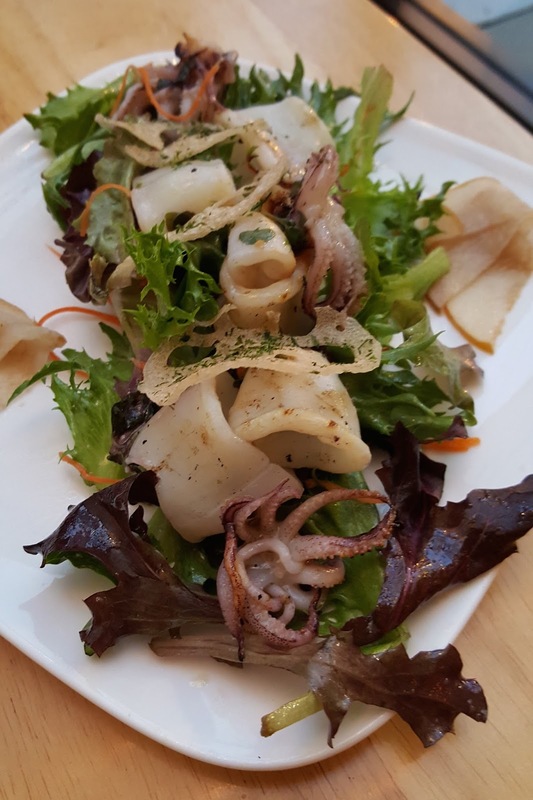 This salad was topped with a generous portion of chargrilled squid, and featured mixed greens tossed in a white wine vinaigrette, with a side of pickled pear. I loved the warm squid that was very tender and had a nice charred flavor. The vinaigrette was not overpowering and the pickled pear had a nice contrast of flavor. 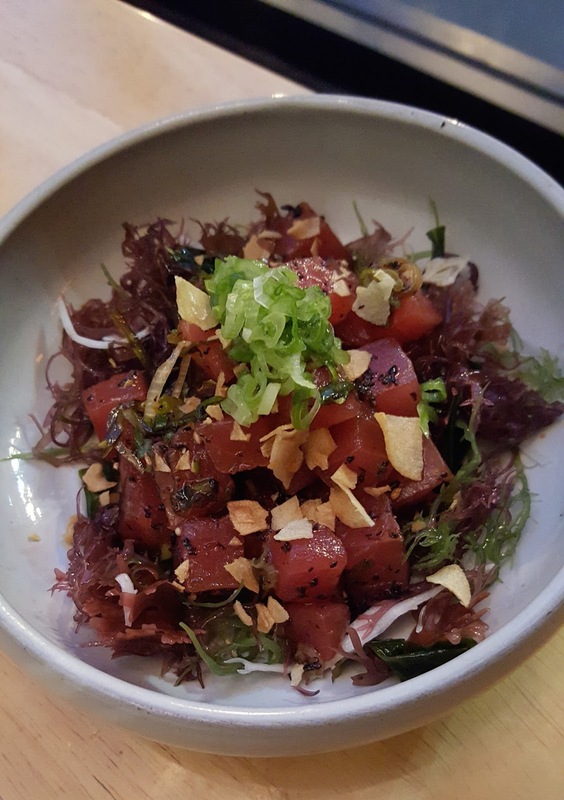 Our last cold dish was the ahi poke served with aged balsamic, kombu, sesame, scallion, and garlic chips. We weren't crazy about the kombu (kelp), but loved the light ahi and crunchy garlic chips. This dish also had beautiful color from the fish and scallion. 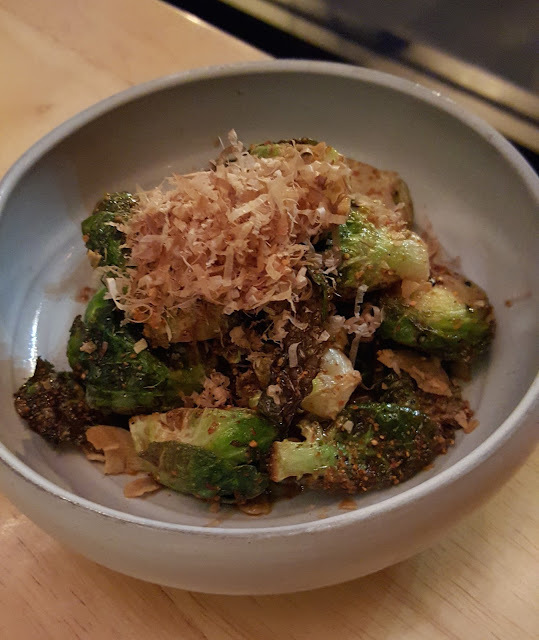 As a precursor to our main dish, we were served a bowl of warm Brussels sprouts. This was not something I'd expect at a Japanese restaurant, but they definitely made it their own. The best part? The house spicy soy sauce. The dish also was served with bonito flakes which I always love because they look like they're dancing on top of the dish (when they react to heat they move!). The sprouts were perfectly cooked--no soggy sprouts here. Next, when we thought we couldn't eat one more bite, the largest dish arrived, lemongrass tori ramen. I know what you're thinking. Ramen in summer? Well this version featured a lighter broth more suitable for warmer temperatures. 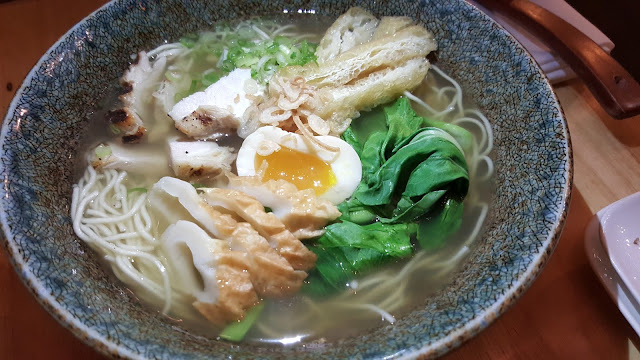 Our ramen was served with chicken, egg, chikuwa (fish product), fried tofu, and fried shallot. I loved the broth and noodles, and oddly enough, I really liked the chikuwa. This was not a spicy ramen so we added some chili oil and togarashi for a little heat. 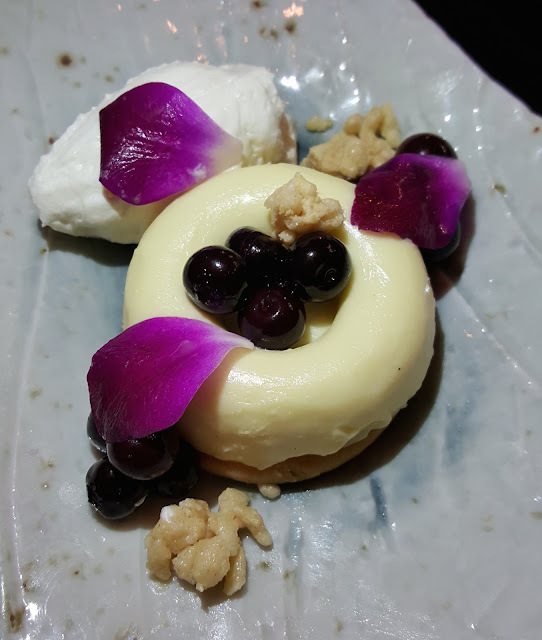 Last, but not least, course seven was a beautiful yuzu curd dessert. It was almost too pretty to eat. The curd sat atop a kinako-almond shortbread, and was topped with sake blueberries, and sesame and white chocolate puffed rice on the side. This was the perfect light summer dessert. I have the biggest sweet tooth of anyone you'll meet and I honestly didn't miss the fact that this didn't have rich chocolate in it. The yuzu was bright and clean and the BF and I devoured the dish in no time. You know what they say, there's always room for dessert. It's clear dessert is not an afterthought at Ani. This dish was just as delicate and well executed as the other courses we enjoyed. I feel lucky I don't live too far from Ani and now I know they deliver! 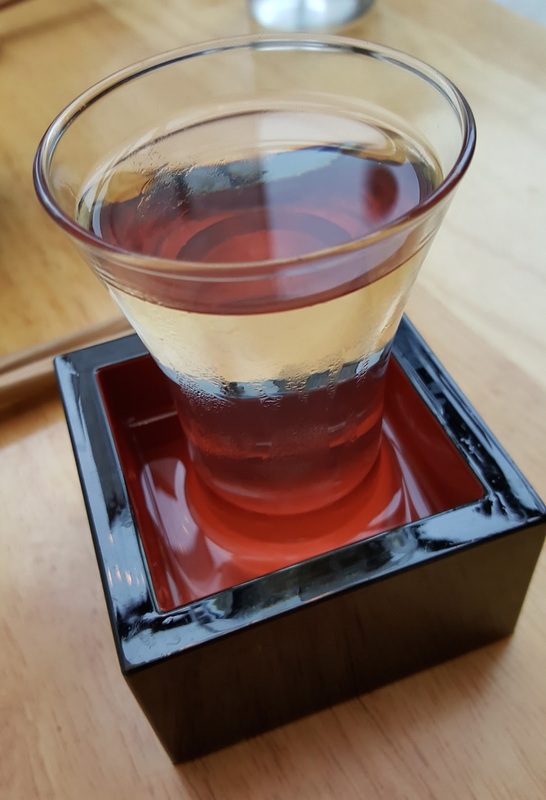 If you're looking for a high-quality and elegant Japanese meal, give Ani a try. They also have a lovely lounge in the back perfect for larger groups and a more intimate dining experience. Note: my meal at Ani was complimentary; however, the opinions expressed herein are my own. I've dined at Ani! 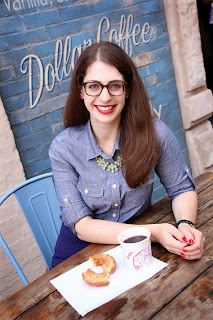 We still talk about the deliciously delightful experience! Looking forward to repeating the thrill on our next visit to Chicago. Nice! So glad you enjoyed...it's a great spot!